Blizzard has accustomed us to surprises served from time to time. But today with the arrival of the new seasonal event – Overwatch Anniversary, players who have not yet an opportunity to try Blizzards FPS will get this chance. Overwatch Free Weekend is coming. The hot period in Overwatch is ahead of us. Blizzard officially announced the arrival of Overwatch Anniversary event with hundreds of cosmetics items to get. Ahead of that, old legendary skins and brawls from other events are back with new Deathmatch FFA competitive mode along with the new map for it – Petra. This time, Blizzard decided to invite everyone to play together and celebrate the second anniversary of Overwatch. 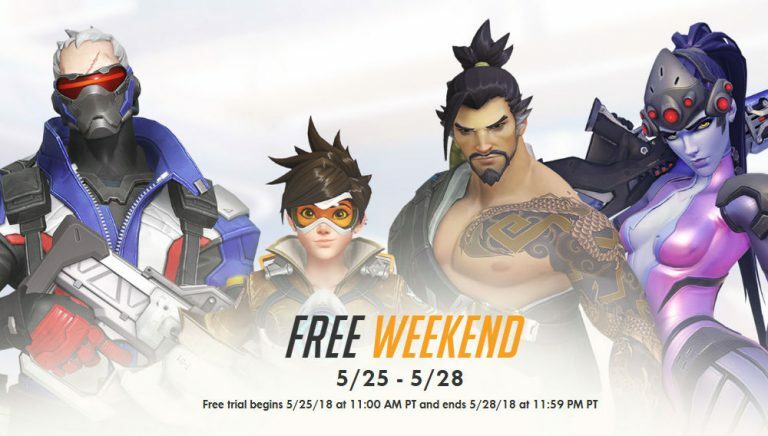 Overwatch Free weekend will start on May 25th and will end on May 28th. If you haven’t chance to play Overwatch you can do it with this free trial. Each player, who starts his adventure with Overwatch will get access to all 27 heroes and 18 maps for various modes including Quick Play, Competitive Game and Arcade, in which there will be Deathmatch or Capture the Flag modes. Each new account will have progression and will gain access to all of the cosmetics items acquired. However, in order to continue playing, you will need yo buy Overwatch during or shortly after the Overwatch Free Weekend. Free Weekend will be available for all players on all platforms: PC, Playstation 4 and Xbox One. Players with PlayStation 4 don’t need PS Plus subscription to play. Detailed information on the installation process of the game can be found on the official website at PlayOverwatch.com. Those of you who decide to stay longer with Overwatch, Blizzard has prepared a special discount with the new edition of the game – Overwatch Legendary Edition which in addition to the content of Overwatch Origins Edition includes additional 10 skins – 5 epic and another 5 legendary. In total, you will receive a game with 15 skins and a whole range of digital content for other Blizzard games. Overwatch Free weekend will also help to increase overall Overwatch player base. As Jeff Kaplan has stated in Blizzard Developer Update, Overwatch already hits 40 million players.